This article is about the arcade title first released in 1983. For further uses, see Mario Bros..
"MB" redirects here. For information about the Mario Baseball series, see Mario Baseball (series). A flyer for the original arcade game. Mario Bros. is an arcade game made by Nintendo and released on July 14, 1983. It was also released on the NES under the Arcade Classics Series series of games (a version itself later ported to other systems), Atari 2600, Atari 5200, and Atari 7800 as well as a large multitude of home computer systems. The game is often stated to be the first appearance of Luigi in a game, moreover, Nintendo officially acknowledged this as well during the Year of Luigi that commemorated his debut; however, this is incorrect as Luigi actually had previously appeared in the Game & Watch game of the same name. Beyond featuring the Mario brothers, the Game & Watch game bears no similarity to the arcade game. Mario Bros. is also included as a separate minigame, playing like the original game with updated graphics, in the two-player mode of Super Mario Bros. 3, for the role-playing game Mario & Luigi: Superstar Saga, and all four games in the Super Mario Advance series on the Game Boy Advance. 7.4 Arcade Archives: Mario Bros. The story of this game revolves around two plumbers, Mario and Luigi, who are working in the sewers of New York. 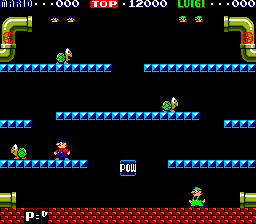 The sewers are overrun by waves of enemies and the Mario Bros. have to defeat the enemies and get coins to receive their pay. Mario and Luigi in Phase 1 of the arcade version. The game features a simple stage in which the player plays in an endless game. Much of the gameplay appears to have been inspired by an arcade game named Joust. Enemies come from the pipes on the top and head downwards, where they may enter the pipes again to return to the top. The game features over 99 phases (although phase 2 was removed from non-Japanese versions of the game) with the highest score possible being 999,990, and after phase 99 has been completed, it merely loops phase 99 from then on. The goal in each phase is to defeat all enemies, which is done by jumping up and hitting the floor below enemies. This flips them, giving the player the chance to kick them away, which is rewarded with 800 points. The POW Block can also be used to flip enemies; however, it can be used only three times. After an enemy is knocked away, a coin (a "wafer" in the Atari 2600 version of the game) appears from one of the pipes, and gives 800 points when collected. When all enemies are defeated, the player continues to the next phase. In later levels, different types of enemies and harming fireballs appear. From time to time, a bonus level appears where all coins have to be collected in order to get an extra 3,000-5,000 points. The POW Block regenerates after the second bonus level and every subsequent bonus level. Unlike the arcade original, the NES version has no kill screen. Upon reaching Phase 100, the screen reads "Phase 0" and the stage is normal. Completing it, it reads "Phase 1" and the game loops infinitely from there. Mario The older Mario brother, who serves as player one. Luigi The younger Mario brother, who serves as player two. GBA-exclusive players Clones of Mario that only appear in the GBA version. The yellow one is player three, and the blue one is player four. They both have light tan overalls in the original, though the Wii U ports replace them with purple overalls (resembling Wario) and black overalls, respectively. Target enemies must be defeated to clear the phase while other enemies should be defeated by the player's discretion. Each phase consists of one or two types of targets with a maximum of six targets. Shellcreepers and Sidesteppers appear together only in Phase 5 (6 in Japan). The last target enemy will always move at its fastest pace unless said enemy is a Fighter Fly. Shellcreeper (Spiny in most versions from Super Mario Bros. 3 onwards) Phase 1 The first enemies in the game, a possible inspiration for Koopa Troopas. They are replaced by Spinies in remade versions. Sidestepper Phase 4 (Phase 5 in Japan) Crab creatures that are harder to defeat and have appeared in various games. The first time the player hits them, they will gain an angry expression and walk faster. The player thus needs to hit them twice before kicking them off. Fighter Fly Phase 6 (Phase 7 in Japan) Flies that jump up and down. The player is unable to hit them while they are airborne, and must wait for them to land. Slipice Phase 9 (Phase 10 in Japan) Ice creatures that possess the ability to "self destruct" and cover the platform they are on with ice. Ice-covered platforms give the Mario Bros. less traction. Renamed to Freezie in later games. Icicle Phase 16 (Phase 17 in Japan) Icicles that at first appear as droplets of Water, before forming into a sharp icicle. The Icicle will eventually fall over, damaging any bros. underneath. Fireball (Boo in Super Mario All-Stars) Phase 1 Gigantic balls of fire that come in two varieties. Red ones bounce diagonally around the stage while Green ones travel horizontally. They can be defeated by bashing them from underneath, just as they hit the ground. The player can also use a POW Block to defeat them as well. In the Super Mario All-Stars version of the Battle mode, the green fireballs are replaced with Boos, though both types appear red in the 2 player mode. Koopa Troopa (Super Mario All-Stars only) Phase 16 (Phase 17 in Japan) Koopa Troopas that randomly appear during the battle mode. Unlike other enemies, they can be stomped, and in the process, the player can kick their shell at other contenders. Bowser (GBA only) Phase 1 Bowser may randomly appear in the GBA version of Mario Bros. during the battle game, possessing the ability to breathe fire on enemies. Coin (Wafer in Atari 2600 version) Coins that appear each time an enemy is defeated, with the exception of the last one defeated. They also make an appearance every five stages in a "Test Your Skill" event. If the player collects all of these coins, they will receive a point bonus. In the Atari 2600 version, the coins spawned from defeated enemies are replaced by Wafers. POW Block POW Blocks always appear in the center of the level, knocking over all enemies on-screen when a brother hits it. They can only be used three times; after the third time, the block disappears and does not reappear until later stages. The game has received mostly positive reviews. IGN rated the game 91st in their Top 100 NES Games list . It has been requested that this section be rewritten and expanded to include more information (tagged on There are ports for non-Nintendo systems. Which ones?). In 1993, Nintendo released a European-exclusive version of the game called the Classic Series version. This version was perhaps the closest port of the arcade game, and was one of only two ports to have intermissions (the other being the Atari XE version). It was based on Kaettekita Mario Bros., and retained all the arcade features from it, plus being able to change direction in mid-air. "Battle Mode" in Super Mario Bros. 3. 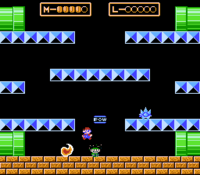 Mario Bros. is included as a separate minigame, called "Battle Mode", in Super Mario Bros. 3 for the NES and as part of the game's remake included in Super Mario All-Stars, utilizing Super Mario Bros. 3's physics and a variation of its graphics. This was the first version where Spinies replaced Shellcreepers, making it more obvious not to jump on the enemy, which would become standard in later remakes to avoid confusion with the ubiquitous Koopa Troopas of later games. It includes two bonus levels - a fountain that sprays out coins, and a series of kickable ? Blocks. A battle can also be entered in two-player mode in the main game, by the active player on the map opening the Ⓜ or Ⓛ that represents the inactive player. This allows the players to fight over the "cards", obtained by finishing a normal level, that give one to five extra lives when three are collected. Title screen of the remake. A remake of Mario Bros. is included in every Super Mario Advance game, as well as the RPG Mario & Luigi: Superstar Saga (though it does not reappear in the 3DS remake). All of these games can connect to each other to play Classic or Battle mode with up to four players. Classic is based on the co-op mode from the original. Battle is based on the Battle Game from Super Mario All-Stars. The remake also uses the GBA's Single-Pak multiplayer feature. It can connect and play with other GBA systems without the game, although Battle is the only multiplayer mode that can be played in this way. The GBA remake of Mario Bros. enhances the graphics to take advantage of the GBA's 32-bit capabilities, including adding backgrounds to the stages. Music is added where it was originally absent, and voice clips are added in single-player mode. Jumping onto platforms has been made easier; mid-air turning is allowed, as opposed to the original where Mario or Luigi had to stay in one direction during jumping. The POW Block resets every few stages, and two such blocks appear now as opposed to just one. The Power Squat Jump from Super Mario Bros. 2 (US version) has been added, and the Bonus Stages are now noticeably easier than they were originally. 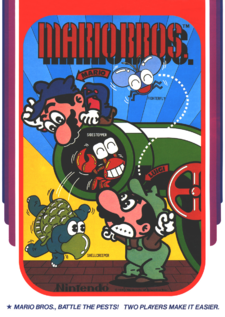 A port of the original arcade version of Mario Bros. was released on the Nintendo Switch on September 27, 2017 as part of Hamster Corporation's Arcade Archives series, under the name Arcade Archives: Mario Bros. The Joy-Con can be used to play in two-player mode. Several direct ports of the NES version, running under emulation, have been released on later consoles. First was Mario Bros.-e, a game for the e-Reader, released on November 11, 2002 in the United States of America only, which omitted the two-player support. Japan next got an exclusive release in the Famicom Mini series for Game Boy Advance, unconnected with the remade version described above, on May 21, 2004. It was also re-released on Virtual Console for Wii for 500 Wii Points in November/December 2006, and for 3DS on May 8, 2013 (Japan), January 9, 2014 (Europe and Australia), and January 30, 2014 (North America, US$4.99). It has also been released on the Wii U for the same price. The NES and Famicom version is also one of the 30 titles included in the NES Classic Edition and Nintendo Classic Mini: Family Computer, respectively. Mario Bros. was made available as one of the 20 NES titles at the Nintendo Switch Online subscription service's launch in September 2018, and features online play. HOW TO PLAY As bad guys fly out of the pipes, punch them from below to stun them. After a short time, they get up faster than before, so kick them while they're down to finish them off. Eliminate all the pests to complete each round. The rounds get progressively harder with new enemies as you go along. You only have a limited time to finish a round before Fireballs show up–don't waste a second! ENEMIES There are five types of enemies in the game: Turtles, Crabs, Fighter Flies, Fireballs, and Freezies. Turtles need one hit to flip, while crabs require two. Fighter Flies can only be flipped when they touch the surface. Freezies come along later in the game to freeze the beam and make life slippery! Two types of Fireballs, red and green will heat you up. Only the POW can get rid of the green ones. SCORING Punch the fireballs when they hit the floor to get higher scores. But beware–revived red fireballs are dangerous! When you exterminate a pest, a coin appears. Hit it to add points to your score. You get special high scores for kicking down several baddies in a row. When your score passes 20,000, you get an extra life. Periodic bonus rounds let you earn more bonus points. Collect 10 within a limited time for a perfect score. TECHNIQUES AND HINTS If a flipped enemy is hit again, it will be returned to full health and be faster and deadlier than ever! If left alone they can also flip themselves over. Try to eliminate them ASAP! Using the POW delivers a hit to all pests that are touching a beam. A POW hit equals one hit, so crabs still need to be hit twice to flip. You only get three POW hits before it disappears. Mario can walk through the left edge of the screen to reappear on the right, and vice versa. Use this to your advantage! The title screen of Luigi Bros.
An emulation of the game known as Luigi Bros. is included in Super Mario 3D World as unlockable content, with the only difference being that Mario is replaced by Luigi in his current appearance (green hat and shirt with blue overalls); player 2's Luigi retains his original appearance (white hat and shirt with green overalls, similar to Fire Luigi's color scheme in later Mario games). If the player has save data of New Super Luigi U, Luigi Bros. can be played straight away without having to be unlocked. Unlike Super Mario 3D World itself, which is usually played using a 16:9 "Widescreen" aspect ratio, Luigi Bros. uses a 4:3 aspect ratio due to the original Mario Bros. NES game using it. Luigi Bros. is unlocked by defeating Meowser in The Great Tower of Bowser Land in World Bowser. The game had three obscure sequels: two direct 1984 follow-ups for Japanese home computers called Punch Ball Mario Bros. & Mario Bros. Special, and a 1995 entry for the Virtual Boy called Mario Clash. Super Mario Bros. 3: The "Battle Mode" is very similar to Mario Bros.'s gameplay. Mario's Time Machine: The NES version of this game features a stage similar to the Mario Bros. arena. Super Smash Bros.: Mario's green recolor resembles the colors Luigi wears in the Japanese artwork of the game. Mario & Luigi: Superstar Saga: A Mario Bros.-themed level appears in this game. A version of the game itself (as in the Advance ports) is also included besides having the flyfighter as enemy. Mario Power Tennis: A court is named after the game, and features many elements from it, such as Shellcreepers, POW Blocks and even similar music. WarioWare: Twisted! : A microgame based on this game appears in 9-Volt's stage. Super Smash Bros. Brawl: There is a stage based on the first stages of the game, as well as an arranged version of the title's music. Super Paper Mario: Super Dimentio indirectly alludes to the Shellcreepers' weakness during the final battle, when taunting Mario and his party that they shall "wallow in helplessness like upside-down turtles!" New Super Mario Bros.: In the Mario vs. Luigi game, there is a jingle that goes off when the player exits the warp pipe, which is the same jingle that plays when the player respawns in Mario Bros.
WarioWare: D.I.Y. Showcase: A microgame based on this game appears in 18-Volt's stage. New Super Mario Bros. Wii: The beginning of World Coin -1 resemble the Mario Bros. arena. New Super Mario Bros. 2: The Mario Bros. arena was remade in the second level of the Gold Classics Pack. Additionally, White Raccoon Mario looks similar to Player 3. New Super Mario Bros. U: World Coin -2 overall resembles the Mario Bros. arena. Super Mario 3D World: Luigi Bros., a port starring Luigi instead of Mario, appears in this game. It is unlocked after the player completes The Great Tower of Bowser Land level. Alternatively, if the player has save data for New Super Luigi U on their Wii U, Luigi Bros. is available from the start of the game. Super Smash Bros. for Nintendo 3DS / Wii U: Mario's blue recolor resembles the colors Mario wears in the Japanese artwork of the game. In the "One Dog, One Bird, One Zapper" trailer announcing Duck Hunt, Mario's footsteps when walking in the classic portion were taken from the footfall sound effect from Mario Bros.
Super Mario Maker: Four of the forms Costume Mario takes on are based on this game. The costumes for Mario, Shellcreeper and Sidestepper are earned as random rewards in 100 Mario Challenge's Expert mode, while the Fighter Fly costume is unlocked upon clearing a harder version of the Gnat Attack minigame. WarioWare Gold: This game contains a microgame that is based on Mario Bros., which is similar to Wario Bros.
Super Smash Bros. Ultimate: The Mario Bros. stage from Super Smash Bros. Brawl reappears in this game. The Arcade and NES versions were directed by Hiroshi Yamauchi, both versions were designed by Shigeru Miyamoto. The music of both versions was composed by Yukio Kaneoka. However the Commodore 64 version music was composed by Fred Gray. For this subject's image gallery, see Gallery:Mario Bros. (game). Start theme - The theme that plays when starting a new game. Level Clear - Music that plays when completing a level. Level Start - Music that plays when starting any level after the first. Demo (With SFX) - Music playing during the instruction videos. Perfect - Music that plays when getting all coins on a bonus level. The music that plays when the player begins Phase 1 is part of Mozart's Eine kleine Nachtmusik, which is also featured in Dance Dance Revolution: Mario Mix and Super Smash Bros. Brawl. Mario's outfit on the Japanese cover would later be used as an alternate costume for Mario in Super Smash Bros. for Nintendo 3DS / Wii U and an alternate costume for Wario in Super Smash Bros. Brawl and Super Smash Bros. for Nintendo 3DS / Wii U. The outfit also made a cameo during Mario's transformation into Super Mario in the DIC cartoons. Additionally, Luigi's outfit on the Japanese cover would later be used as an alternate costume for Mario in the Super Smash Bros. series and an alternate costume for Wario in Super Smash Bros. Brawl and Super Smash Bros. for Nintendo 3DS / Wii U.
Mario and Luigi have three different death sprites. A frozen one for colliding with Slipice and Icicles, a burnt one for Fireballs, and finally a generic one for all other enemies. ↑ "Exclusive Interview With Nintendo Gaming Mastermind Shigeru Miyamoto". Popular Mechanics. October 19, 2009. Retrieved 25 November 2009. ↑ Mario Bros. Atari instruction booklet, page 2. ↑ GameXplain. (September 13, 2017). Arcade Archives for Nintendo Switch Announced (Mario Bros. more). YouTube. Retrieved September 13, 2017. This page was last edited on April 17, 2019, at 08:53.